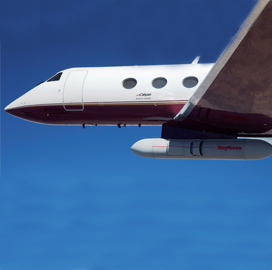 Raytheon (NYSE: RTN) has received a potential $1.01 billion contract to help the U.S. Navy design, build, integrate and demonstrate new jammer model pods. The company will also produce Next Generation Jammer aero-mechanical test pods for use in aircraft flight verification, develop equipment for system integration laboratories and provide mature manufacturing processes, the Defense Department said Wednesday. The Navy intends for the NGJ system to replace the legacy ALQ-99 jammer onboard the military branch’s fleet of EA-18G carrier-based electronic warfare aircraft built by Boeing (NYSE: BA). Raytheon will produce the pods in California, Mississippi, Texas, Indiana, Virginia, Massachusetts and Arizona through December 2020. The NGJ system is designed to help the Navy perform airborne electronic attack and jamming operations. Raytheon was first awarded a contract to build electronic jammer technology for the EA-18G in July 2013.